Intestinal parasites are more common in the United States than often thought, says Anne Louise Gittleman, Ph.D. In fact, 90 percent of humans will have a problem with parasites in their lifetime. Increased travel and dining out are to blame, says Gittleman. Because parasites are thought to be rare here, many doctors don’t routinely screen for the bugs as the cause of cramps, fatigue, nausea or bloating they can cause. As a result around three in four people with parasites are never diagnosed. Along with other precautions, consuming foods and beverages that contain enzymes and substances thought to kill parasites or make the body more resistant to them can help. 7. 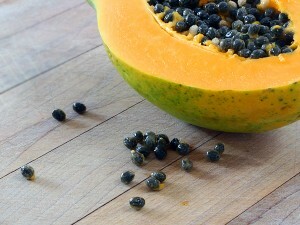 Papaya seeds. *Should not be eaten while pregnant.